Set-up for success: Co-captain Logan Watts (number 14) prepares to over-hand serve the ball across the net during the match against the Atlee Raiders at Varina High School. The JV Blue Devils lost each set match, 23-9 and 25-23. 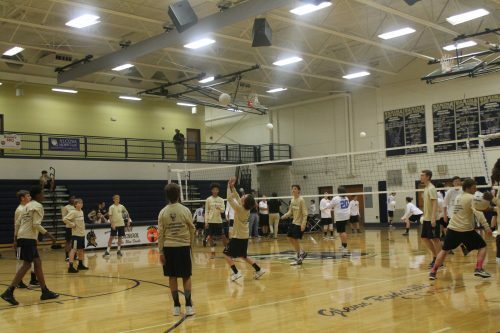 JV Boys Volleyball seems to be having a tough season this year. Last year the JV boys were doing well against their opponents. Many of the sophomores are wondering what the difference is between last year and this year. This year the boy’s JV team had lost to teams they usually beat. JV Boys Coach Richard Catalano tells the boys what they could improve on and gives them constructive criticism that the boys don’t take lightly. Sophomore Captain Logan Watts said that when he makes mistakes, he also makes sure that he fixes them. “I try to make my passes perfect. If it is not perfect, I adjust to make the required changes,” Watts said. With the season off to a rocky start, the JV boys continue to find ways to keep their spirits up. Watts said that he tries to stay motivated, hoping that it will rub off on his teammates. Sophomore floor captain Robert Darnell said he cheers the team on even when they’re down. Sophomores Nick Marshall and Logan Watts continue to better themselves physically at Richmond’s Volleyball Club by working on the areas they have the most problems in while playing volleyball. Not only does the team work on their skills, the team also works on their bonding. Dailey says the team does bonding activities to help them get a closer relationship. “Even though we may lose sometimes, I am still able to have fun with my friends,” Dailey said. Although the boys aren’t having a great season, they are working as a team physically and mentally to change their rankings. Mr. Catalano said that his boys are hardworking and know that they can still turn their season around.